LG has almost single handedly revitalised the high-end of the TV market with its high performance OLED flatscreens. An early champion of OLED technology, the brand now offers a wide range of OLED models, with its display division supplying panels to a growing number of brands, including Sony, Panasonic, Philips, Toshiba and Loewe. OLED TV technology was first developed in 1987, but really didn't begin to come into its own until 2013. Since then picture improvements have been landing thick and fast, with the latest HDR enabled UHD TVs looking particularly fine. But LG isn’t just about OLED. It offers a tempting selection of edge-lit LED LCD 4K TVs, in screen sizes that range from 43-inches up. And, remember, all LG connected 4K TVs employ the lauded webOS smart platform. So what model is best for you? 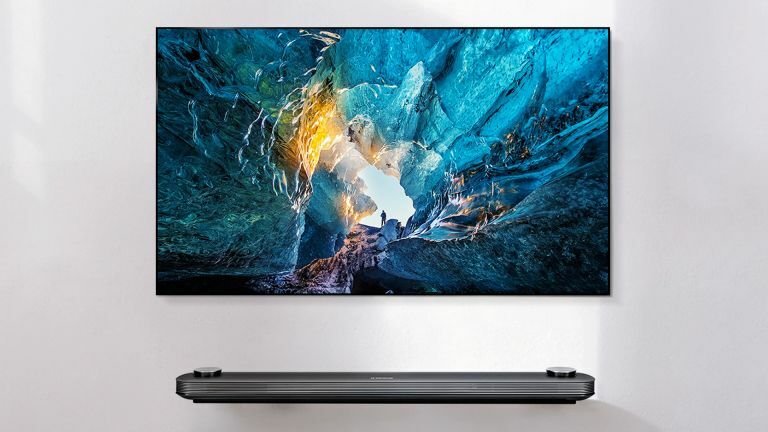 Check out our top LG TVs buys below, and then decide if you want to go with a posh OLED, or make the most of your budget with an edge-lit LED LCD alternative. The C8 is more of a mid-range offering than the W8 but it is still a gorgeous bit of televisual art, with glass stretching edge-to-edge against a gunmetal grey backdrop, with barely a rim to keep it in place. The C8, like the bulk of LG’s 2018 OLEDs, uses the new Alpha 9 intelligent processor. This high performance silicon boasts the most advanced image processing we’ve yet seen on a consumer TV, and image quality is unequivocally exceptional, once you navigate the thick forest of screen modes. The C8’s HDR performance is dramatic and bright. The C8 has no problem handling spectral highlights, which when coupled with deep rich blacks, translates to deliciously dynamic pictures. Shadow detail in near blacks is also exceptional, and the vibrancy of colour and sheer tangible detail in 4K content can be astonishing and the C8 also looks superb with HD material. There’s just so much to enjoy in its images. There's also AI, with LG’s webOS platform adding intuitive search and voice control. You can even verbally select picture modes. The C8 also looks consistently fabulous with games, with a lag of just 21.1ms, which is excellent. Oh and there's a Dolby Atmos decoder, which works with streamed content from Netflix, as well as external sources such as Sky Q. Just hook up your set-top box to the TV and use HDMI ARC to send Atmos to a compatible sound system. In short, you need this TV. It's one of the finest OLEDs to date, and not even crazily expensive, in the great scheme of things. It’s been dubbed the wallpaper TV, and with good reason. The remarkable 65-inch W7 is an OLED television unlike any other. It comprises a deconstructed panel that you can bend (a bit) and stick it to a wall using magnets. Although it's now a year old it’s still no great hyperbole to describe picture quality as jaw-dropping. The W7 delivers deep blacks, superb shadow detailing and vibrant colours. Wallpaper has rarely looked so good. The W7 supports HDR, HLG and Dolby Vision, as well as some additional HDR treatments. Onboard picture enhancements are many and varied. A Bit Depth enhancement algorithm improves low grey level, and there's also a de-contour algorithm, to reduce noise. A Neutral Black polariser further improves contrast for daytime viewing. Oh and how do you hang a wallpaper TV? Simple! The panel comes with a wall plate, as the TV. The panel then slots into this directly, secured by die cut magnetic slots. An umbilical cord then links the screen to a soundbar hub. It’s this that carries power and AV. With that in mind, connectivity is good. The hub has four HDMI inputs, all HDCP 2.2 compliant, plus three USBs and minijack AV. Tuner options are Freeview Play or Freesat HD. If we do have a caveat, it’s that while Atmos enabled, the soundbar hub doesn’t really doesn’t have the speakers to do anything with 3D audio. It’s completely bereft of bass, too. But heck, who cares? This is a wallpaper TV people. Welcome to the future! The 2018 upgrade, logically called OLED65W8, is even better than the W7, but not by a very large margin. So, if you can find a W7 at a price notably below £8,000 it is still well worth considering. If the wallpaper W7 is LG’s poster boy OLED TV, the Signature series G7 is the premium model for those in search of a more conventional form factor. It doesn’t exactly shy away from opulence, mind. The panel is bonded to a glass backing, with tuner and electronics located on the back and in the pedestal plinth. This base can be repositioned in order to enable wall-mounting. Connections include four HDMI inputs, all HDCP 2.2 compliant, plus three USB inputs and an optical digital output. The set has two terrestrial Freeview Play tuners, and twin satellite tuners. Freeview Play support means you get a full collection of catch-Up TV players, as well as Netflix, Amazon Video and YouTube in 4K. Certified Ultra HD Premium, picture quality is excellent - blacks are deep and convincing, colours bold and vibrant. It’s HDR10, HLG and Dolby Vision compatible, so expect plenty of razzle dazzle. The integrated 60w soundbar is also mighty impressive. Tonally rich and with plenty of volume, it’ll more than do justice to movies and sport. The set can also pass-through Dolby Atmos, so you might still want to budget for an external AV Atmos receiver. • The 2018 LG G8 will be along shortly but has not hit the shops yet. Again, it is not likely to hugely trump its predecessor, so if the price is right, the G7 remains highly alluring. This high-spec HDR hottie might be a resident of the budget aisle, but it has a spec that promises so much more. Built upon LG’s excellent webOS 3.5 smart platform, and with a Freeview Play tuner offering integrated mainstream catch-up TV channels, it’s well equipped. With fast loading access to Netflix, Amazon Video, YouTube and Now TV, plus niceties like screen sharing and media playback, usability is top notch. Picture quality is vibrant, with predictably good off-angle viewing. The IPS panel used here has a limited black level, but you can combat this by watching in a room with a certain level of ambient light, rather than full black out conditions. High Dynamic range support covers HDR10 and HLG, but there’s no Dolby Vision provision at this lower part of the LG screen range, which is fair enough. Ultra Luminance local dimming is used to maximise peak highlights, while a contrast booster lifts regular SDR (Standard Dynamic Range) sources. Build quality and design are cookie cutter, but no worse for it. We get four HDMI inputs, USB, a legacy AV connection, plus a digital optical audio output. All in all, a remarkably comprehensive 4K package for not much dosh at all. Don’t tell anyone, but there’s no significant difference in panel or picture processing technology between this and the G7 and W7 above. Image quality is just as outstanding, and the only thing that actually separates these sets is their cosmetic design and audio provision. Of all LG’s 7-series OLED variants, the B7 is probably our most compelling recommendation, with a leading edge spec and premium design, for not much money. The B7’s distinctive silver finish extends to the back of the panel, where it contrasts with a white plastic casing. The set is ridiculously thin, swelling only to accommodate electronics. You’ll get four HDMI inputs, all HDCP 2.2 compatible, plus three USBs, and digital optical audio output. The set comes with a Freeview Play tuner and the latest iteration of LG’s webOS connected platform. The latter offers a few new features, including 360 degree video playback and an OLED still image gallery, but it’s largely unchanged from what we’ve seen before, which is a good thing. Netflix streams with Dolby Vision, as well as Dolby Atmos audio. There's also Amazon Prime Video and YouTube in 4K. The B7 can route Dolby Atmos audio out over HDMI ARC, which is a cool party trick. Just add an Atmos soundbar or AV receiver for immersive 3D audio. Also worth noting: LG's OLEDC7 TV range is identical to the B7 in terms of the panel but perhaps slightly less attractive. To compensate it has slightly better sound, although as with the B7 you'll still want to add a soundbar or other external audio booster. Offering a lot of screen inches for the money, this big UHD LED LCD TV should appeal to 4K buyers seeking a huge home cinema screen. It ticks all the right (telly) boxes: Smart connectivity? Check. HDR images? Check. Accommodating price point? Check. LG’s minimalistic webOS platform is built around a scrolling, intuitive bar of channels, inputs and features; it supports fast switching between terrestrial channels and streaming services like Now TV, Netflix, YouTube and Amazon Prime Video. The tuner is Freeview Play, with built in catch-up TV apps, accessed through a roll-back programme guide. The set boasts a strong picture performance (high levels of detail and deep colours) with a wide viewing angle. There’s also comprehensive HDR support. In addition to the industry standard HDR10, the set is compatible with Dolby Vision and broadcast HLG formats. Only connectivity betrays its mid-range ranking: there are just three HDMIs, thankfully 4K ready, and two USBs. But you’ll not need to worry about such things if you’re hooking it up to one of our best AV receivers, will you? • Also consider: the LG 65UJ630V is, to all intents and purposes, the exact same telly as this, but with a different look – ie: it's on little legs rather than a crescent-shaped stand.